Thomas Friedrich, Kinshofer president and CEO, celebrates with Lifco and Hammer partners. 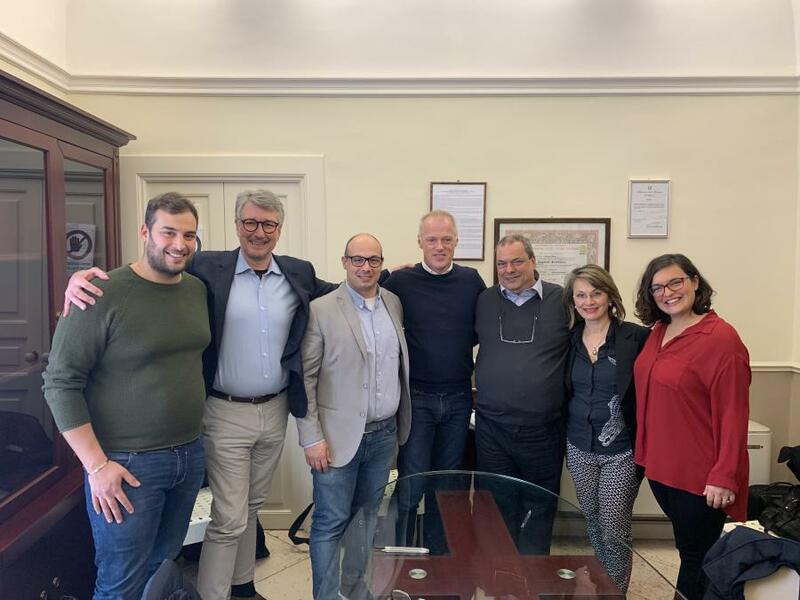 (L-R) are: Onofrio Modugno, Hammer partner; Erik Gabrielson, Vinge — Lifco RA; Valerio Modugno, MD Hammer; Thomas Friedrich, Kinshofer president and CEO; Giovanni Modugno, Hammer partner; Giovanni and Valerio’s sisters. Kinshofer, a global manufacturer of excavator and loader crane attachments, is expanding its product line to include hydraulic breaker excavator attachments following the acquisition of Hammer SRL, an Italy-based manufacturer of demolition, excavation, recycling and material handling attachments. Kinshofer chose the company because of its reputation for quality and more than 30 years of experience in the market. The new line includes 22 breakers for carriers from .5 ton to 200 tons and joins an already expansive line of Kinshofer tools. "These breakers allow us to offer our customers access to a full range of attachments all in one place," said Francois Martin, Kinshofer North America general manager. "Hammer will be a great addition to our group of companies, bringing with them high-quality attachments and a state-of-the-art manufacturing facility." The breakers are made up of the KSB Series for carriers from .5 ton to 12 tons and the KFX Series for weights from 8 to 200 tons. Each line includes features to improve operator comfort, reduce wear and improve longevity. The acquisition also includes a variety of grapples, buckets and more. These will serve as an alternative to Kinshofer's premium attachment line for the price-restricted customer. The Hammer management team will stay in its entirety and will continue manufacturing in Italy. Hammer and Kinshofer will add additional staff to ensure a smooth launch of Hammer's products and services worldwide through Kinshofer's global network. The acquisition of Hammer demonstrates Kinshofer's commitment to being a global leader in the attachments industry and bringing customers only the best tools, according to the company. Hammer brings extensive experience designing and manufacturing attachments for a variety of carrier types. Like Kinshofer, the manufacturer uses strict quality control during the entire process, from careful examination of the steel to be used to the actual creation of the attachment. That attention to quality was a primary reason Kinshofer chose Hammer. "We send representatives to every manufacturing facility we acquire to ensure quality standards are consistent," Martin said. "It's important to us that our customers receive only the best. It's why we offer a broad two-year warranty on all of our attachments, including the new breaker line."